What could be better than a drive across the glorious heather moors before dropping down into the stunning village of Staithes on the North Yorkshire coast? 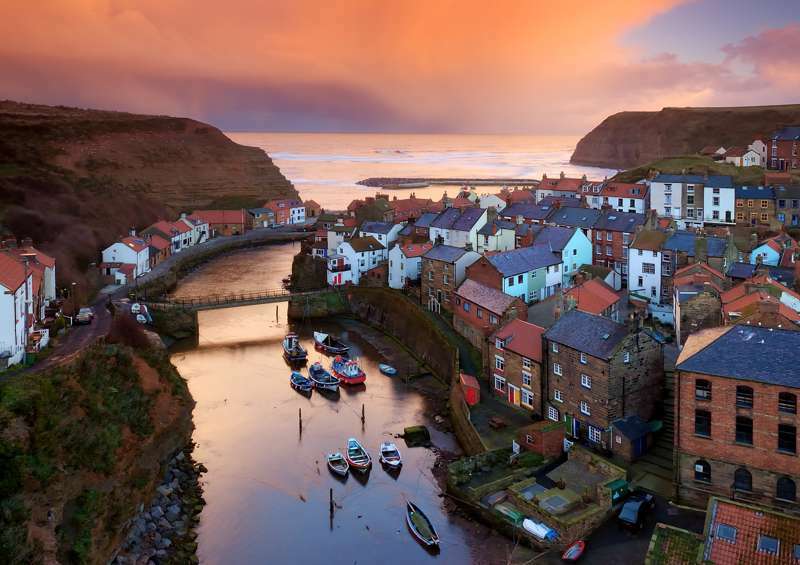 Once a busy fishing community, Staithes is a jumble of whitewashed, pantile-roofed cottages clinging to the hillside, threaded through with narrow cobbled ginnels leading to the pretty harbour and beach. They still do a spot of fishing here, but historically it's also a bit of a magnet for artists – sort of a northern St Ives. An important artist’s colony, the Staithes Group, lead by Dame Laura Knight began to form in the village from the early 1800’s. Many of the artists trained in Paris at the height of the Impressionist movement and brought to Staithes ‘plein air’ painting; they were at the forefront of British Impressionism and a major retrospective of Knight’s work can currently be seen in the National Portrait Gallery. Making art in the village has enjoyed a revival of late and Staithes Festival of Arts and Heritage reflects the work being produced today. , Following the success of last year's festival, this year promises to be even bigger with 130 artists exhibiting in 90 venues. Taking place over the weekend of 13/14 September, scores of cottages and public buildings will throw open their doors to the public as pop-up galleries selling work by local and visiting artists, including painters, ceramicists, jewellery makers, sculptors and photographers. You can wend your way around the maze of lanes discovering the galleries, and drop into pop-up tea rooms along the way for a hot drink and some homemade cake. There will be walks, talks, film shows and workshops celebrating both the art and the fishing heritage of Staithes; you can learn how to make a lobster pot from a member of one of the oldest fishing families and take a guided walk round the village, discovering some of its fascinating hidden corners. The festival will also showcase the best artistic talent from Staithes to Whitby and beyond. Visitors can meet the artists in each venue and find out more about what’s on show before buying. With street music (including shanties from the Men of Staithes Choir) outdoor cinema and slide shows, there’s tons of fun for the whole family.